With depots in Rathcoole, County Dublin and Newcastle West, County Limerick, Cunningham Transport is a well-established company that is dedicated to providing their customers with a professional and comprehensive distribution and storage service covering Ireland, UK and Europe. From humble beginnings, Cunningham Transport has evolved into one of the country’s most trusted and respected transport companies. Mike Cunningham set up the business in 2000 before his son Bryan took over the reins in 2013 with a fleet consisting of four trucks and a van. Mike started off with a van doing fruit and veg distribution to wholesalers and shops in the Munster area for a local veg company. Steady expansion resulted in the growth of the customer base and a number of the early clients still use their services to this day. At present, the Limerick headquartered company is running 15 tractor units and 20 trailers and they offer their clients distribution 24 hours a day, 7 days a week to and from Ireland, UK and Europe. This includes full, part loads and groupage for refrigerated goods and ambient goods. Euro liner, tautliner, flat bed, bulk tipper, containers, box vans, low loader work to and from Ireland, UK and Europe. “We’re currently running two trucks nightly and daily to Dublin,” explained Bryan. “We’re working on behalf of some big freight companies in Dublin, taking their groupage and distributing throughout Cork, Kerry, Clare, Tipperary and Limerick. We’ve essentially become their link to the Munster region. “We also run a rigid out of our depot in Dublin servicing the Leinster area. We are in a position to offer a next day service throughout Ireland through a strong network that we have built up. “As well as that, we’re covering UK nearly daily at this stage. We offer our clients a Day 1 for Day 3 service but we can do Day 1 for Day 2 if they require it. Most, however, are going for the Day 3 option. “On top of that, there’s a groupage run to France every Friday and delivery to Paris on a Monday morning. We’ve been running that service for 12 months now and it has been going good and steady for us. We’re covering France, Belgium, Holland, Germany, Sweden and Norway. We have a truck based permanently in Holland and the plan is to have a second one out there before the year is out. “We’ve also a van working locally for last minute.com stuff for meat factories,” Bryan added. 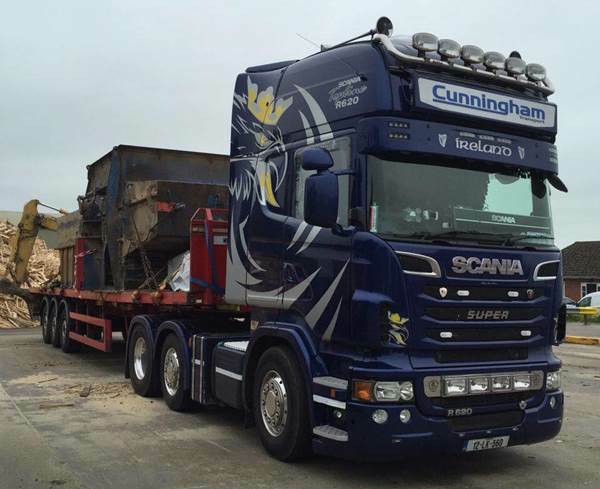 Cunningham Transport can also offer their clients storage in their two depots in Limerick and Dublin. Both depots can cater for long and short term storage for frozen/chilled/ambient products; pick and pack facility with nationwide delivery; cross docking and container loading/unloading. The family-run company is renowned for its prompt collection and delivery service and their ability to adapt to customer needs. Customers range from small local businesses to blue chip companies, all of which are provided with the same level of service regardless of size or profile. One of the key ingredients in Cunningham Transport’s successful formula is their professional and motivated workforce. There are currently 21 employees on the payroll and Bryan was keen to highlight the valuable role they play in the day-to-day operations of the ever-burgeoning company. “A lot of our staff members have been with us a long time and moved up the ladder to managerial roles. One driver has been with us 10 years this year which is a noteworthy thing these days. Good drivers are hard to get and a shortage of drivers is a major problem in the industry as everyone knows along with rising insurance and fuel costs.